The Majorana fermion, a particle that is its own antiparticle, was originally introduced as a putative elementary particle by Ettore Majorana in 1937, and the chiral Majorana fermion was experimentally observed in topological superconductors in 2017. Since the Majorana fermion is a charge-neutral particle, the direct effect on Majorana fermions by electromagnetic methods should fail. Now, researchers have proposed a scheme to control the transport of chiral Majorana edge modes in a ring-shaped Josephson junction of a topological superconductor using magnetic flux. Exotic excitations with characteristics of Majorana fermions in condensed-matter systems are attracting widespread interest due to their non-Abelian braiding statistics with possible applications in topological quantum computation. Topological superconductors provide a fertile ground supporting these Majorana excitations at their edges and at topological defects. Theoretical proposals show that such an exotic superconductivity can be realized by bringing certain topological matters in proximity to an s-wave superconductor. In 2017, the group led by Prof. Wang at the University of California, Los Angeles, realized the chiral topological superconductor by coupling a quantum anomalous Hall insulator with an s-wave superconductor and observed a half-integer conductance plateau, which provides a likely signature of chiral Majorana fermions. To further exploit the practical application of Majorana fermions in realistic devices, it is crucial to control and manipulate Majorana excitations in condensed-matter systems. Considering that the Majorana fermion is a charge-neutral particle, the direct effect on Majorana fermions by electric or magnetic methods should fail. A recent study proposed a magnetic method to control the transport of chiral Majorana fermions in topological superconductors. The related research paper, titled "Magnetic flux control of chiral Majorana edge modes in topological superconductor," was published in SCIENCE CHINA-Physics, Mechanics & Astronomy, volume 61, 2018. The research work was completed by Ph.D. students Zhou, Hou, Lv and Prof. Sun and Prof. Xie, School of Physics, Peking University. The researchers studied the transport of chiral Majorana edge modes in a hybrid quantum anomalous Hall insulator-topological superconductor system in which the topological superconductor region contains a Josephson junction and a cavity as shown in Fig.1. The Josephson junction undergoes a topological transition when the magnetic flux through the cavity passes through half-integer multiples of magnetic flux quantum. For the nontrivial phase, a zero-energy Majorana state appears in the cavity, while it vanishes for trivial phase. With the aid of the resonant tunneling between the zero Majorana state and the chiral Majorana edge modes encircling the outer perimeter of topological superconductor, the transport direction of the chiral Majorana edges can be changed as denoted by dashed arrows in Fig.1. This result suggests a magnetic method to control the chiral Majorana fermions. Further analysis shows that three different transport patterns can be identified for a pair of incoming chiral Majorana fermions in this system: (a) both of them are totally reflected back; (b) both of them are transmitted to another lead; (c) one of them is reflected back and another one is transmitted to another lead. 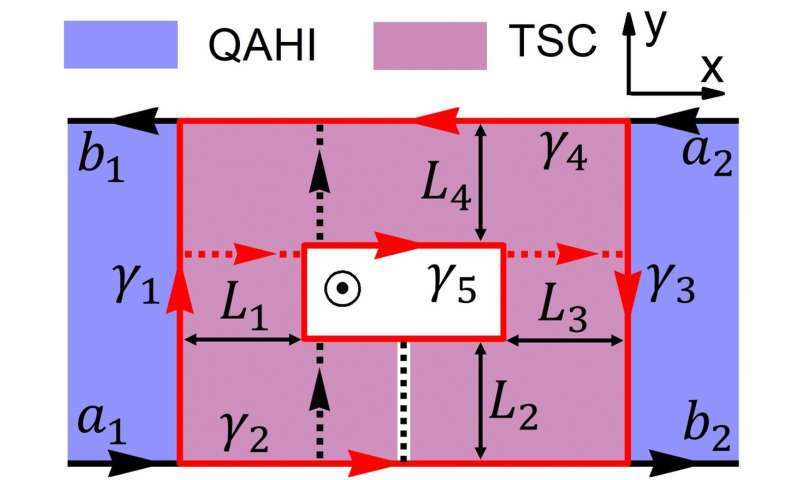 The transport pattern can be switched by changing the size of the topological superconductor region and magnetic flux. "These findings may provide a feasible scheme to control the transport of chiral Majorana fermions by using the magnetic field," the researchers explained, "and have potential applications for braiding the Majorana states."